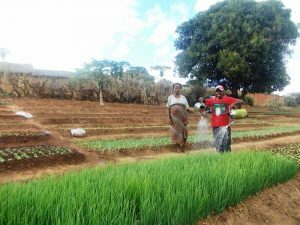 The Andabatoara Morarano community garden is 5 km to the south of Ihosy, in the Ihorombe region. The land is terraced and located along the Morarano river; it must be watered daily. The site can only be cultivated in the dry season because the rise and ebb of water in the rainy season make this a flood zone risk. The land is estimated to be 13 ares in all. The garden is tended by 7 members: four women and three men. 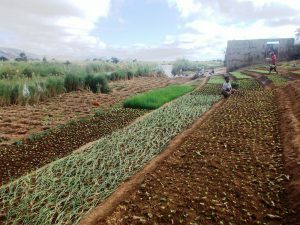 They practice cultivation diversity like: papaya, chives, “petsaï” (leafy vegetable from Brassica family), onions, sweet potatoes and courgettes. The farmers use exclusively organic fertilisers from vegetable waste that they make on site, enriched with manure from their cattle. Because this is a community garden, garden work from production to sales is coordinated by a group leader named Andry. They previously used organic, mechanical and/or physical and manual means, but at the same time, they also used a few pesticides. 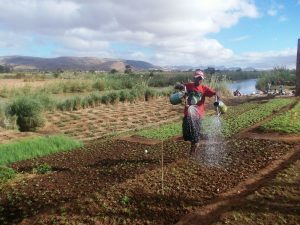 After being trained, they now use ecological processes for biodiversity and cycles adapted to local conditions, rather than pesticides and other means that have harmful effects. In addition, the produce from this cultivation diversification plays a double role that is definitely indispensable for the members: it is a food source and a means to purchase daily necessities. On the other hand, it also helps with their children’s school fees. Moreover, food safety has been improved by reducing the lean periods. The Indian Ocean island of Madagascar is known for its rich biodiversity. The country’s rainforest is home to a large number of different animals and plants, and around 90% of these species are endemic. Despite this natural wealth, Madagascar is one of the world’s poorest countries and its extraordinary resources are under relentless threat from deforestation, overexploitation and land grabbing. 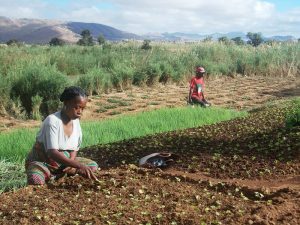 In countries like Madagascar, the sustainable use of natural resources is crucial to guaranteeing food security. 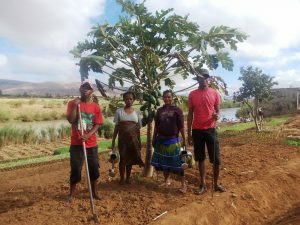 The Slow Food network in Madagascar has been growing since 2004, the year of the first Terra Madre gathering. The convivia participate in many local events to raise awareness among consumers, and are actively researching products for the Ark of Taste. Since 2012, Slow Food community and school food gardens have been producing fresh, diversified food for local communities and educating young people about agrobiodiversity. Two Presidia have also been established in the country, Mananara Vanilla and Alaotra Lake Ancient Rice Varieties.